The easy and cost-effective Netstor PCIe to PCIe expansion system NA250A features easy plug and play installation, containing PCIe 3.0 x8 host card and data cable for up to 64 Gbps high-speed transfer. The NA250A is configured by the BIOS from the workstation or server automatically, which makes all the PCIe slots on NA250A available to the workstation or server. Any combination of x1, x4, x8 and x16 half-length or full-length PCIe cards is supported by all the PCIe slots on NA250A, providing a solution with high-performance and high bandwidth 64 Gbps for expanding PCIe I/O capacity outside the workstation or server. 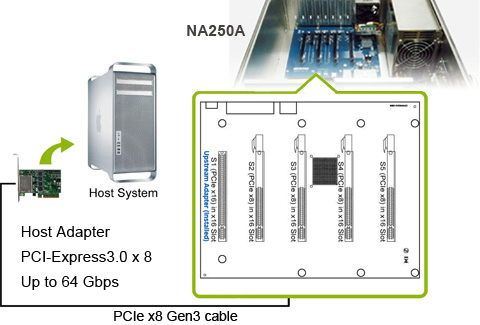 NA250A renders flexibility to expand the I/O capabilities of a workstation or server, allowing an expansion of six PCIe slots for graphics card users, a perfect solution for adding GPU cards to workstation or server with limited PCIe card space. NA250A gives large cost savings to graphics card users because of its support of the increasing need of I/O expansion, and its elimination of the need to invest in new computer hardware. In addition, consistent configuration of workstation or server is maintained, and a cost-effective way to expand the number of PCIe slots is provided, offering increased capacity and scalability for PCIe I/O capabilities. NA250A is ideal for video editing professionals and developers for improving the performance of GPU-intensive application. Individual user or video editing professionals at animation studio do not need to spend as much as two or three times the money for GPU workstations since NA250A provides a low-cost PCIe expansion system for upgrading GPU performance. The benefits of GPU computing can be applied in various areas including digital content creation, medical research, motionDSP, financial simulation, 3D seismic interpretation, molecular modeling, 3D Ultrasound TechniScan, gene sequencing, weather modeling, and astrophysics. All of the work is made faster and more efficient due to GPU technology, which means a quicker result as well as dollars and energy saved.